“Compared to the breadth of knowledge yet to be known, what does your life actually matter?” asks pilot Rosa Dasque in the new science fiction film Europa Report. The film, inspired by burgeoning scientific interest in Jupiter’s fourth largest moon Europa, follows a crew of six international astronauts as they journey to the moon’s surface on the Europa One mission to collect samples that could fundamentally alter what we know about our existence. “When you watch the movie, you see a sense of the passion for the intrinsic scientific value of going to Europa, regardless of whether or not we find life,” said Dr. Steven Vance, an astrobiologist at NASA’s Jet Propulsion Laboratory in Pasadena, Calif. whose research on icy worlds has focused extensively on Europa. Finding life is, of course, a prime motivator in the ongoing study of Jupiter’s moons and a major plot driver in the movie. After all, the 3,120 kilometer wide body of ice on Europa caps an ocean potentially ten times as deep as the ones on Earth.The allure of the bitterly cold, desolate environment lies in clues discovered during and after NASA’s 1989-2003 Galileo mission, which sent an unmanned spacecraft on a six-year journey to reach Europa and, once there, collected data that scientists to this day continue to scrutinize. Images from the mission show cracks on the moon’s surface, which researchers believe are caused by the raising and lowering of the subsurface ocean’s tides when Europa is closest to Jupiter. The potential warmth of the subsurface ocean caused by this tidal heating is a promising sign of the possibility for life. Furthermore, earlier this year scientists discovered a signature of magnesium sulfate that supports prior evidence from the Galileo mission that Europa’s ocean and surface engage in a chemical exchange. 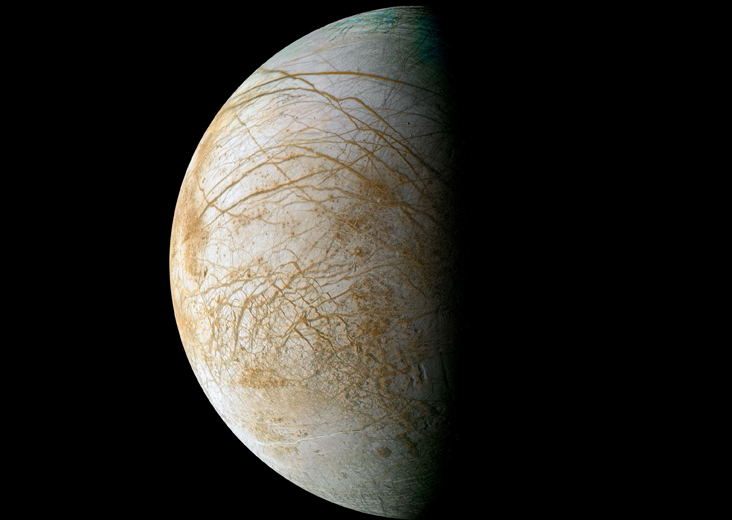 Europa, in this sense, may be energetically rich enough to sustain life. These factors together entice just the kind of imagination necessary to create a fictional account of deep space exploration. The challenge for Europa Report was producing an account that is plausible as well. “It [was] very tempting along the way to say that the story [was] more important than the accuracy,” confessed the film’s director Sebastián Cordero in an interview with journalist Alyse Wax from FearNet.com. To curb the temptation, Cordero and the screenwriter Philip Gelatt conversed extensively with Vance and another JPL scientist, Dr. Kevin Hand. A primary concern was how the filmmakers would deal with the very real issue of Europa’s highly radiated, and therefore uninhabitable, surface. Vance described the film as a “cautionary tale” for future Europa missions. Although a manned mission to Europa is not in the foreseeable future, the European Space Agency is planning a 2022 launch of the Jupiter Icy Moon Explorer (JUICE) spacecraft that will observe Europa—and Jupiter’s other moons—in more detail. Additionally, NASA is exploring the logistics of launching a spacecraft into Jupiter’s orbit called the Europa Clipper, a mission concept to investigate Europa’s habitability by determining the thickness of its ice shell and providing high-resolution mapping of its complex surface geology, among other goals. Vance emphasized that any future mission would focus heavily on the guiding principle of planetary protection, which aims to prevent the biological contamination of both the celestial body and Earth. Although some are criticizing the movie for falling short of its trailer intrigue, Vance holds that the film does succeed in portraying Europa as an observation-rich environment and is optimistic that the faraway moon could, indeed, harbor life. The movie opens in theaters August 02 and is available on iTunes and Amazon now.